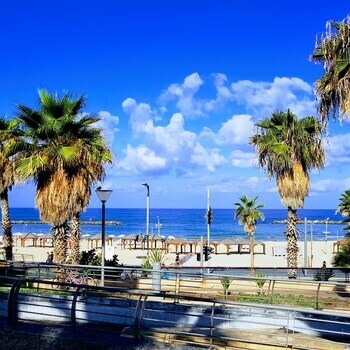 With a stay at Central Hotel, you'll be centrally located in Tel Aviv, just a 4-minute walk from Frishman Beach and 8 minutes by foot from Gordon Beach. Featured amenities include a computer station, express check-in, and express check-out. A shuttle from the airport to the hotel is provided for a surcharge (available 24 hours), and self parking (subject to charges) is available onsite. With a stay at Ahuzat Kinorot in Tiberias (Tiberias Old City), you'll be a 5-minute walk from Tomb of Maimonides and 5 minutes by foot from Saint Peter's Church. Free self parking is available onsite.